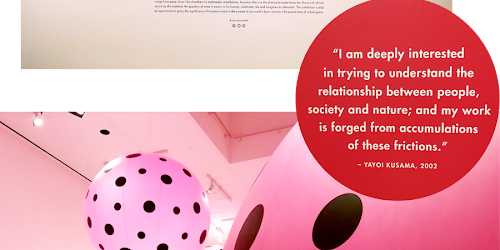 As most of my Toronto readers probably know from all the Instagram stories and photos, Yayoi Kusama has finally arrived in Canada! I was lucky enough to see her exhibit a few weeks ago, in the beginning of March. The Art Gallery of Ontario is hosting Yayoi Kusama's Infinity Mirrors exhibit, though all advanced tickets have been sold (the website indicates there may be more releases, depending on capacity, so check back on their website for updates). I have been keeping my eye out for this exhibit since last summer when I saw that it was an upcoming exhibit on the AGO member newsletter, so I was beyond excited to go! 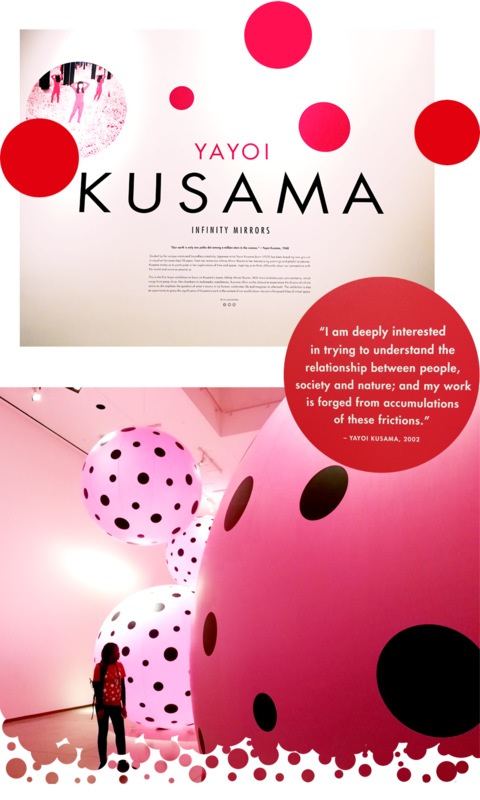 Kusama is known for her infinity mirrors, dots, and love for pumpkins - all of which are incorporated in this exhibit. The Toronto exhibit has six infinity mirror rooms. My favorites are Dots Obsession - Love Transformed into Dots (which is why I have named this post after the exhibit) and The Souls of Millions of Light Years Away (below). Aftermath of Obliteration of Eternity came close as well. If you're thinking the names seem a bit odd, keep in mind there may be something lost in translation. There is just something about the pink Kusama chose for the Dots Obsession space that perked me up - something about the black dots against the bright pink balloons that awakened the dormant curiosity in me. Also, the pink color just really made me happy and cheery. It was really surprising, how physically small each room actually is. Yet, when I stepped inside and the door closed, I couldn't help but feel small in the infinite space reflected before me. 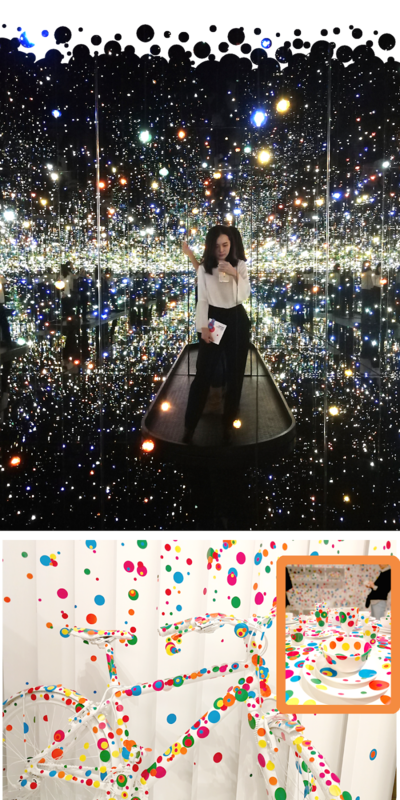 Kusama is a genius in the way she utilizes mirrors to overcome the physical limitations of space. If you are going, I highly recommend spending the first ten or fifteen seconds in the room without your phone, and just immerse yourself in the experience! The last stop of the exhibit is the Obliteration Room - an entirely white room for the visitors to decorate with bright, circular stickers. Because I went in the first week of the exhibit, there was still a lot of white space. Even so, it was really intriguing to see patterns emerging - all through the uncommunicated collaboration between strangers. © Love, A. Design by FCD.